To be honest, I'm still confused about this book. I read it in two 3 hour stretches within one day and maybe that was too quickly for this sort of book. But I loved it, so just let me flesh out some thoughts here before I tell you why this book is amazing. Rose Edelstein has a peculiar skill which she discovers the night before her ninth birthday. 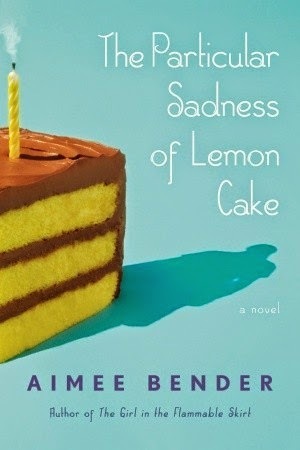 At her request, her mother baked her a beautiful lemon-chocolate cake that tasted of despair and hollowness. Yes, TASTED of despair and hollowness. Rose learns that day that she has the ability to taste the undercurrent of feelings within the chef, in food she eats. Not only that, but over time she learns to discern the layers within each bite. The eggs are from Michigan, gathered by a happy farmer. The thyme was plucked rudely, by a guy who is obviously a jerk. Although the skill seemed amazing to me at first, readers quickly learn that it's almost a curse to be subjected to the overpowering, awful tastes of rage, depression, and grief. And when her supposed happy mother is cooking all of her meals, Rose begins to learn her mother is full of secrets and feelings that taste awful. This book is written in four parts, and I must admit that I feel like I must read it again to understand it better— to get that readers satisfaction of completing a journey. I do not consider this a mindless, easy read. I had a hard time telling what might be significant enough to play into future revelations, and what parts were just helping build the story and characters, since they all felt the same. Because of that, anything was free game in major significance. I found myself concentrating very hard on every single sentence and event so I could remember it well enough and not have to flip back through pages to find understanding in revelations. We follow Rosie and her family through many years. (Age 9-22 for Rosie.) And some times, aside from the fact that Rosie has an extraordinary ability and her family has some deep issues, I kept wondering where the story was actually headed. Then Bender writes something that entirely captures your attention that you forgot you were doubting her. In truth, you never really get the answers to the big questions. You dip into each member of Rosie's family (Mom, Dad, Joseph) in ways that are entirely revealing, and ways that confirm you don't really know much about them after all. I had one major question I wanted answered about each of Rosie's family members (and you will probably have the same ones I did) and I never got them answered. I also wish that Rosie got to taste something her dad made. She tasted food made by her mother, Joseph, her friends, and even herself. I wish we'd been allowed a glimpse into his true feelings too. Those things kind of bothered me, but at the same time it was easy to let go because of the way the story works. It felt like this story was not one of Bender's creation, that she could manipulate and change for ideal outcomes. It almost felt like she had spied on Rosie's life for a certain number of years and then stopped. That the story was just a chunk out of someone's timeline, taken for what it was rather than waiting to find all the answers. Because some times we never get those answers in real life anyway. I couldn't put the book down. There were points where I was hungrily turning pages in my curiosity. Most of all, on each page I found a delicious one liner—a description that so simply captured a feeling or moment that you could feel, see or taste the moment right out of your own memories. This book was the essence of brilliant word craft. As Rosie grows and learns how to manipulate her ability, she is able to get some reprieve and find foods of refuge. Through her family's deep problems (nothing like her best friend Eliza, whose mother-made sandwiches always taste of love and joy) they each have their own way of coping. Some ways which are startling, others which are hurtful. In the end, I'm still thinking through what this book is really about. It's not really about a girl with powers to taste feelings. I think it's about understanding human nature, meanings of love and devotion, escape, understanding how people deal with their lot in life, or how to deal with revelations that lead you to see things are not as you thought they were. It makes you question and ponder. For me, I feel like this is a perfect book club selection. You need to read it with lots of other people so you can discuss it afterwards. I highly recommend this book. I'll be reading it again. And if you want to discuss it, let me know, because this book is full of discussions. Drink it with water. Pure, clean water, untouched by feelings and has the power to cleanse.